Brian Burns believes his drop in sack totals from his freshman year to 2017 was more about him than opponents. 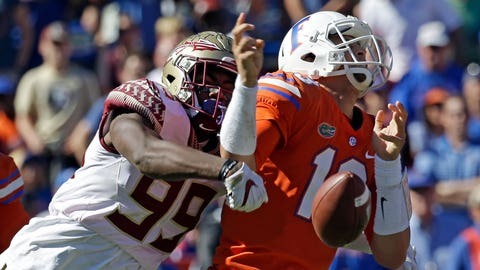 The Florida State defensive end had just 4.5 sacks a year after he had a breakout 9.5-sack debut season in 2016. But the 6-foot-5, 231-pound pass rusher is almost incredulous when asked if he thought offensive lineman had figured out how to defend him. Burns became a “student of the game” and learned not to lean on quickness off the edge. Burns earned more playing time in 2017 and as a result and his tackle totals jumped to 48 (from 23) and he accumulated 13.5 tackles for loss (up from 9.5). He also knocked down four passes, forced three fumbles and recovered another fumble. With the exception of the sack totals, it wasn’t a bad second year — especially considering how he wrapped up 2017. Burns had two sacks and two forced fumbles in the loss at Clemson and 1.5 sacks in the win at Florida, both of which were November games. “That’s why you’ve seen those flashes at the end of the season, because I was growing up,” Burns said. He could continue to grow in new defensive coordinator Harlon Barnett’s scheme, which has a four-man front and will feature more aggressive, attacking principles than what Charles Kelly implemented in prior years. While no team in the Atlantic Coast Conference has the caliber of defensive line that Clemson features, the Seminoles‘ group should be able to frustrate opposing quarterbacks. Burns leads a group that includes sophomore end Joshua Kaindoh, senior tackle Demarcus Christmas and sophomore tackle Marvin Wilson. Burns said that Kelly’s defense was more “conservative” whereas Barnett’s is more “get in your face,” something he thinks will be evident when the Seminoles open at home against Virginia Tech on Sept. 3. Defensive ends coach Mark Snyder, who has been the head coach at Marshall and a defensive coordinator at Texas A&M, Ohio State and South Florida, said he compares Burns’ pass-rush capabilities to that of former Aggies star Myles Garrett, who was the No. 1 overall pick by the Cleveland Browns in 2017. After learning through his second year at Florida State, there is a sense that Burns’ athleticism, knowledge and maturity blended with his talent could deliver a level of production that’s similar to or beyond what he offered as a freshman.